Hon. Premier Donaldson Romeo joined his counterparts from the other British Caribbean Overseas Territories in Miami, Florida last week to discuss their approach to requesting recovery aid from the United Kingdom. A release from published by the Office of the Premier Cayman Islands follows. The Premier, Hon. 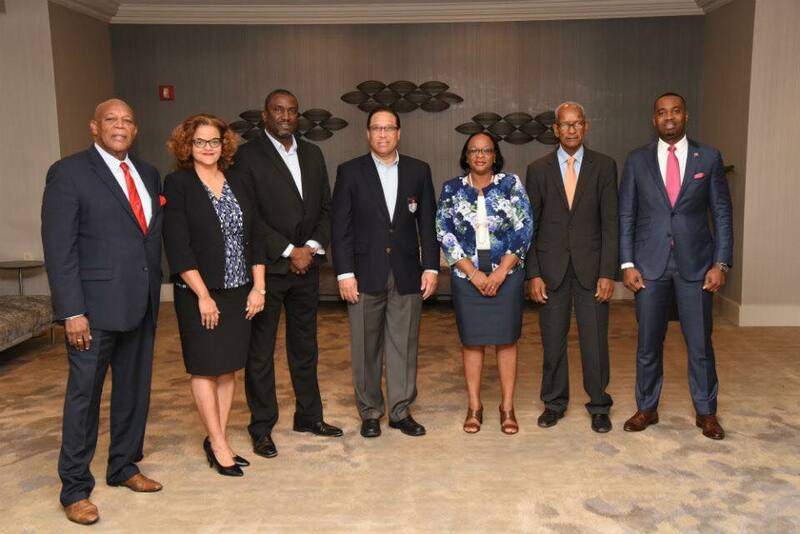 Alden McLaughlin returned from Miami over the weekend after chairing a special meeting of elected Heads of Government from Caribbean British Overseas Territories. Hon. Tara Rivers who has Ministerial responsibility for Hazard Management Cayman Islands also attended. Other Heads of Government in attendance included Chief Minister of Anguilla, Hon. Victor Banks; Premier of Bermuda, Hon. David Burt; Premier of the British Virgin Islands, Dr. the Hon. Orlando Smith; Premier of Montserrat, Hon. Donaldson Romeo; and Premier of the Turks and Caicos Islands, Hon. Sharlene Cartwright-Robinson. This special meeting of the Caribbean British Overseas Territories was arranged and hosted by the Cayman Islands to allow leaders to discuss disaster response, recovery, building resilience, preparedness and mitigation in respect of the unprecedented hurricane season of 2017. In addition the aim was to ensure that these topics are top of the agenda at the upcoming Joint Ministerial Council (JMC) meeting, which will be held on 27th and 28th November in London. Leaders of the affected islands expressed their gratitude for the humanitarian, law enforcement and military assistance provided by the UK Government and fellow Overseas Territories in the immediate aftermath of Hurricanes Irma and Maria. They also noted the visits by the Foreign Secretary Boris Johnson, Secretary of State for International Development Priti Patel and Minister with Responsibility Overseas Territories, Lord Ahmad. £62 million in relief funds has already been confirmed by Lord Ahmad. However, what remains unclear is whether these funds include the cost of deploying the military, the ships and the assistance that came immediately after the hurricanes. If this is the case, available financial aid could be diminishing rapidly and there could be little left for ongoing relief and recovery. The meeting began with updates from the three islands impacted by the hurricanes on the current status of their recovery efforts, and estimates of both the cost of damage and the cost of recovery. The discussions highlighted some of the lessons learned including the need for public buildings, home owners and businesses are better insured, strengthening infrastructure, and improving building codes and discussed ways of providing each other with further assistance, expertise and technical support. One significant challenge is that the islands affected are unable to access the UK’s £13 billion aid budget, because they are classified as “high-income countries” by the Organisation for Economic Co-operation and Development (OECD). This has caused controversy in the UK and has led to Priti Patel, Secretary of State for International Development writing to the OECD asking for changes to its rules to reflect the fact that small island nations are particularly vulnerable to disasters like Irma despite their national income. These efforts seem to have had some success, as on Monday, 30th October, the body that sets international aid rules was to consider allowing access to aid by the OT’s impacted by hurricanes this year. At the moment though it’s not thought any decisions on this will be made in the short term. Hurricane Irma: Aid rule change to be considered. The meeting concluded with agreement to a joint letter signed by all leaders of the Caribbean Overseas Territories that would be delivered to Lord Ahmad. The letter sets out the urgency of focusing the upcoming JMC agenda on matters to do with disaster relief and recovery. In addition, a formal request will be made for a meeting with Prime Minister Theresa May, who has shown a continued interest in the welfare of the affected Territories. The attached communique was agreed by all leaders at the end of this meeting. Lord Ahmad, Minister for Overseas Territories will host the JMC meeting on 27th and 28th November in London.